In the era before digital transformation, fleet and operations managers frequently relied on the costly "management by the rear view mirror" budgeting strategy. This is a circumstance which was unavoidable with a paper-based fleet management system. In other words, managers would look back on past incidents of vehicle downtime, try to discern patterns, and budget for maintenance accordingly based solely on past fleet performance. Without access to the decision-making tools of big data, managers really had no choice. Thus, the fleet management sector muddled along as best it could, trying to glean meaningful numbers to crunch from mountainous archives of paper reports often of dubious accuracy. Downtime, as a result, emerged as the dominant fleet expense for many enterprises. The problem is that researchers have found that the true yearly cost of downtime is underestimated by as much as 8 times what the fleet anticipates to spend on downtime costs. As our business colleagues on Wall Street are so fond of reminding us, "Past performance is not an indicator of future results". First, we'll take a look at the high costs of old fashioned paper-based fleet management, then we'll show you how fleets can optimize up-time with the power of Whip Around data and the efficiency of real-time decision-making. Even companies with the best traditional practices for DVIRs, DOT compliance, and corrective maintenance, are finding that the cumbersome administrative burdens generated by antiquated paper-based fleet management techniques. They restrict workflow and contribute drastically to vehicle downtime costs. A recent fleet maintenance survey disclosed that downtime costs for fleets can average $448-$760 per day. Average in-house repair time, the actual "wrench time" required for most truck repairs was just 5.4 hours. However, excruciatingly slow, paper-based workflow extended downtime by as much as 2.7 days. For leased vehicles requiring external maintenance, the numbers worsened to 4.5 days while fault reports were submitted, and subsequent work orders were generated, eventually shuffling their way to the waiting mechanic at a snail's pace. Downtime nearly doubled even though the average wrench time for external repair jobs dropped to just 4 hours. With traditional paper-based fleet management, there is no way to accurately monitor how a vehicle is being driven or performing. Fuel transactions, odometer readings, checklists, and fault reporting all rely on the discretion, judgment, and integrity of the driver and his willingness to keep his paperwork accurately updated. Problems such as fuel consumption, costly traffic congestion patterns, and excessive mileage logged can only be detected after the fact "in the rear view mirror". At Whip Around, we give you the vital data you need to make fleet decisions in real-time and put problems like these in the rear view mirror. The move from paper-based DVIRs (Daily Vehicle Inspection Reports) to a digital one is akin to the move from candles to the light bulb. To take the analogy a step further, fleets which continue to rely on paper-based DVIR and maintenance might find themselves in the same position as those candle makers after the invention of the light bulb. Out of business. Fleet owners and operations managers know that when it comes to unplanned corrective maintenance when it rains it often pours. An inconvenient flurry of vehicle failures can snowball into an episode of costly downtime affecting production, reducing fleet availability percentages, and placing additional wear and tear on the vehicles in the fleet which must take up the slack for nearly 3 days on average. Fleet managers get the data they need from drivers to relay to mechanics with the speedy convenience of the smartphone without a pen touching paper. Important fleet assets can rocket right to the wrench time stage, bypassing the expensive downtime pile-ups which are inherent in old fashioned paper-based maintenance programs. Without the cluttered paper trail delays, managers get a sense of the big fleet picture in real time, so the most important assets are attended to first. Mobile friendly forms allow drivers to add photos and comments so fleet managers can prioritize repairs in collaboration with in-house or external mechanics. The mobile-friendly Whip Around app lets drivers conduct inspections anytime, anywhere, so the whole team can stay up to speed and consult on the immediate action required to keep the fleet rolling and earning after an accident or mechanical failure. It would be pretty difficult to find anyone in fleet operations who is fond of paperwork, from the drivers to the mechanics, to the office manager buried in a paperwork archive of DVIRs required by his country's DOT. That said, most rolling fleets have developed effective paper maintenance checklists based on hard-earned experience gathered over the years on the road and on the job. Whether your traditional checklists are on paper or Excel spreadsheets they can be easily converted into powerful mobile inspection forms in minutes. 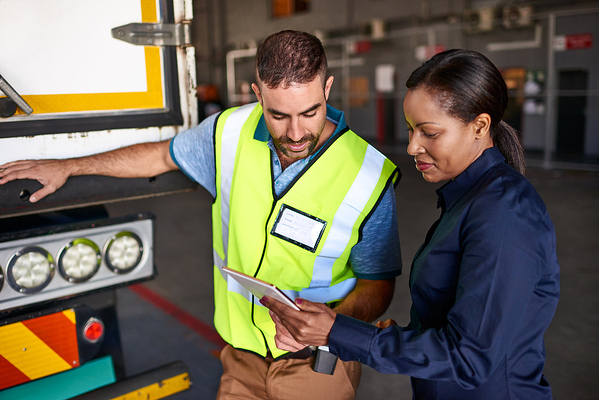 Whether your fleet has a dozen local vehicles or thousands spread internationally, smart mobile checklists keep you abreast of what's working well and what requires corrective action. WA combines the power of smartphones and Cloud technology that allows you to stay ahead of faults and repairs and reduce the costly impact of downtime. Whip Around allows you to automate your data integrations to sync odometer readings, view a vehicle's current location, and manage alerts and driver behavior. Fleet management systems can be synced as well, so you'll only have to update a single system when adding or removing vehicles. Fuel transactions can be tagged by vehicle. Whip Around can be integrated seamlessly with our API which you can check out here.